Definitely save this Beer Bread for later! You’re going to want to make it again! (and again and again!) You probably already have the ingredients in your cupboard! BEER BREAD! 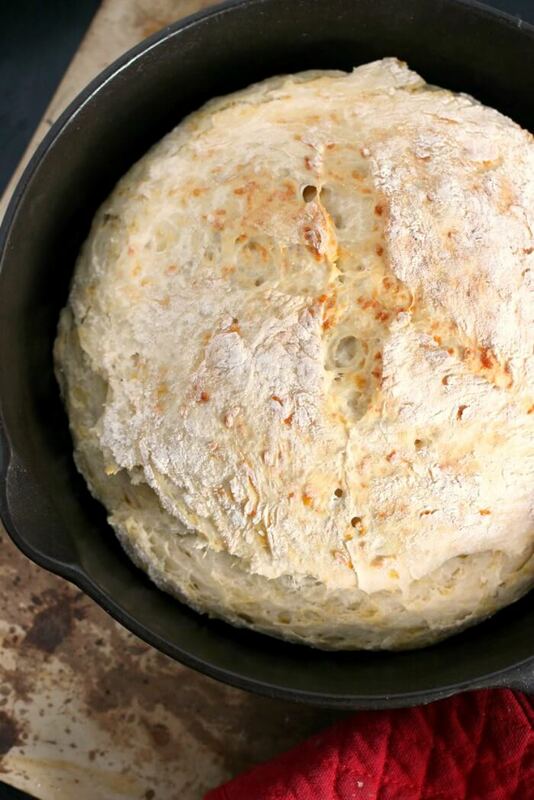 Mildly cheesy, garlicky, heavenly, no-knead beer bread. But in light of being inspired by one of my favorite book series, we’re also calling it Tavern Bread. Just sounds so historical and wenchy. Who wouldn’t want a quick beer bread recipe to whip up in a jiffy? This bread looks and smells like what I (probably completely inaccurately) imagine one would find in a 1700’s tavern. Of which they visit plenty in the books. I’m picturing you serving it with a really hearty beef stew that’s been simmering over the fire all day long, and a cold dark stout. Make this with some potato soup or crockpot corn chowder or corned beef and cabbage and you’ll be in comfort food heaven! Yeast – I keep a jar of active yeast in my fridge, but you can use the little packets as well. Water – Warm to the touch–not too hot or you’ll kill your yeast! Beer – Raid the fridge; the choice will affect the flavor so you can experiment to find your favorite. Garlic Salt – The touch of garlic makes this soooo good, and you need some salt for flavor as well. 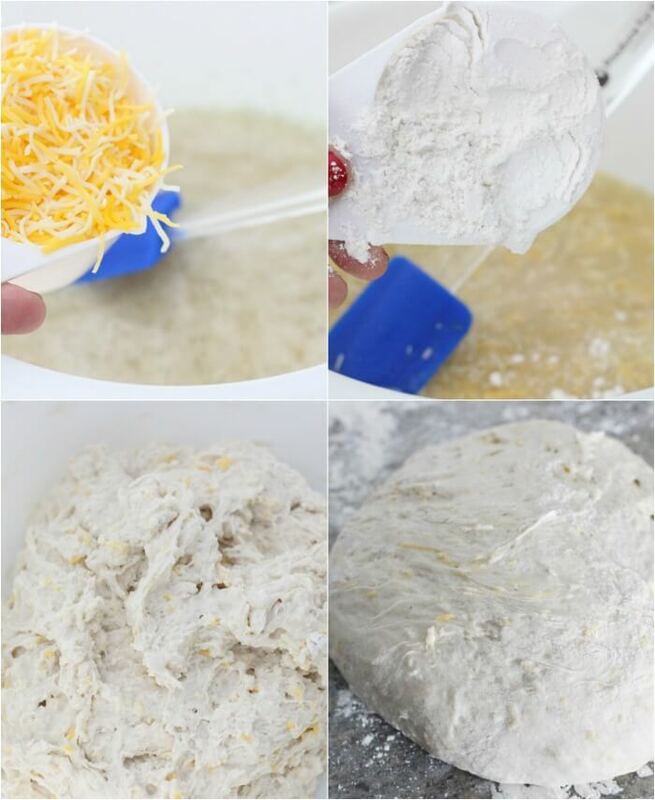 Shredded Cheese – Finely shredded cheddar, mixed, or whatever your favorite hard cheese is – this is another fun way to experiment with this recipe. All Purpose Flour – All purpose flour is probably in everyone’s cupboard (well, except those gluten-free folks). 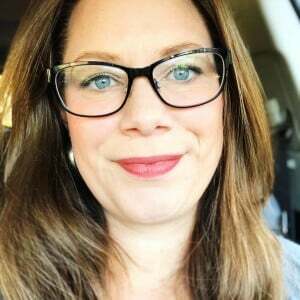 Don’t substitute other types of flour in this recipe, not even self rising, as it contains ingredients other than flour like baking powder and salt – it will mess up the ratios! This is not a quick bread but it is so easy to make and doesn’t involve any kneading whatsoever (yay!). Next, add beer, salt, and cheese to the bowl and mix well. 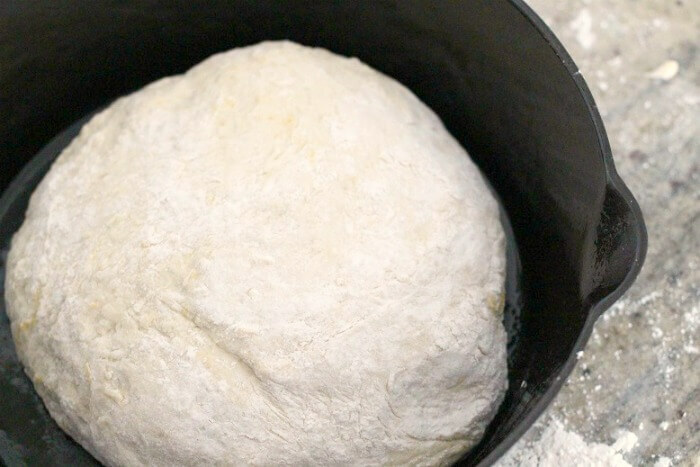 Add flour in one cup increments to form a sticky dough. Then, let dough rise in warm place for about an hour. 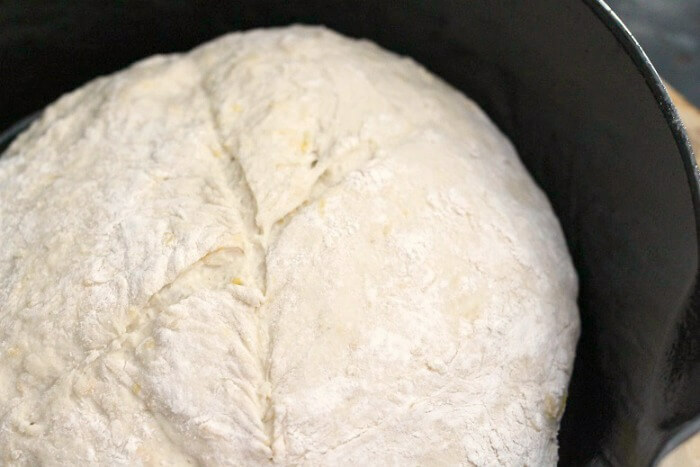 When dough has risen, our the batter onto a floured surface, punch dough down and roll into a ball shape, placing ball in prepared cast iron or bread pan. Finally, bake until golden brown and crispy and perfect, then enjoy with melted butter on top, or plain, or dunked in soup, or as a sandwich! 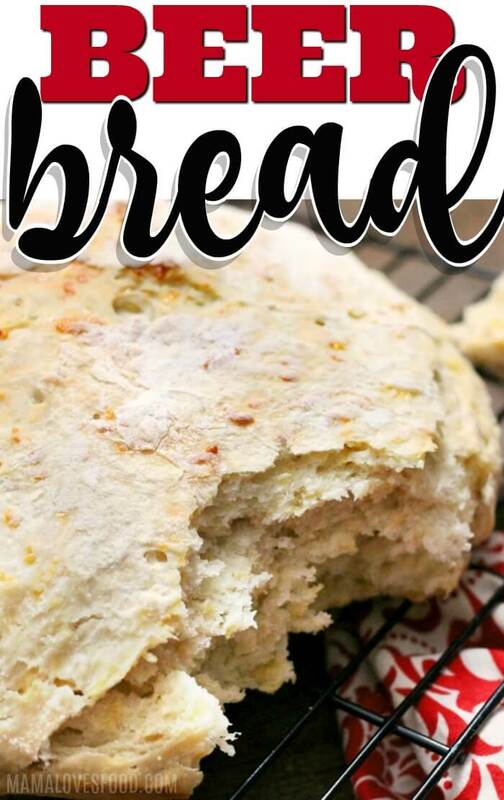 Check out more bread recipes! Guinness for a darker loaf and a malty taste. Brown ale is a great choice, as it will hold up to the cooking and give a bit of sweetness. Belgians will leave a boozy flavor due to their high alcohol content. Beer will not make bread rise, as the amount of yeast in the beer has been decreased by the fermentation process. You must use bakers yeast (not brewers yeast) to get a rise from your bread. Beer bread has been around almost as long as agriculture humans! The earliest record of combining beer and bread is from the Sumerians in Mesopotamia circa 4000BCE. Beer and bread have a kind of “chicken and egg” vibe–we’re not sure which came first! Beer bread tastes like a slightly dense, chewy bread with a flavor of whichever beer you opted to put in it. It is not, however, alcoholic, so anyone can eat it. Most people, even those who don’t like beer, like the taste of beer bread. If you like your beer bread sweeter, you can add a tablespoon of granulated sugar to the dough when preparing. 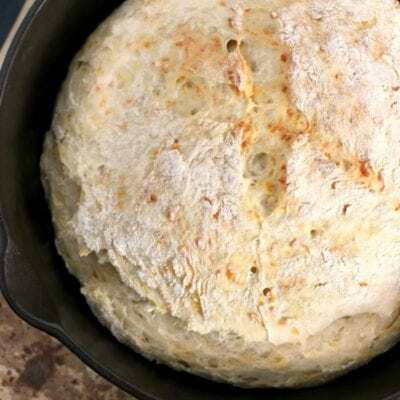 You can eat beer bread when pregnant, as the alcohol has cooked out of the final product. Beer bread cannot make you drunk, or even give you a buzz, as the alcohol has been baked out. Beer bread can be vegan, but my recipe uses cheese so is not. Beer bread will last a few days on your counter (at room temp) in a sealed plastic bag. Because it does not have preservatives, it will start to stale fairly rapidly. If you’re not going to finish the whole loaf, wrap the completely cooled remainder in plastic wrap, then in aluminum foil and freeze. It will last 3-6 months in the freezer. If it starts to stale it makes fantastic toast, or you can crumble it in the food processor and slowly dry in the oven for bread crumbs. Definitely save this Beer Bread for later! You're going to want to make it again! (and again and again!) You probably already have the ingredients in your cupboard! 1 & 1/2 cups finely shredded cheese I used a blend, but just cheddar is great too! 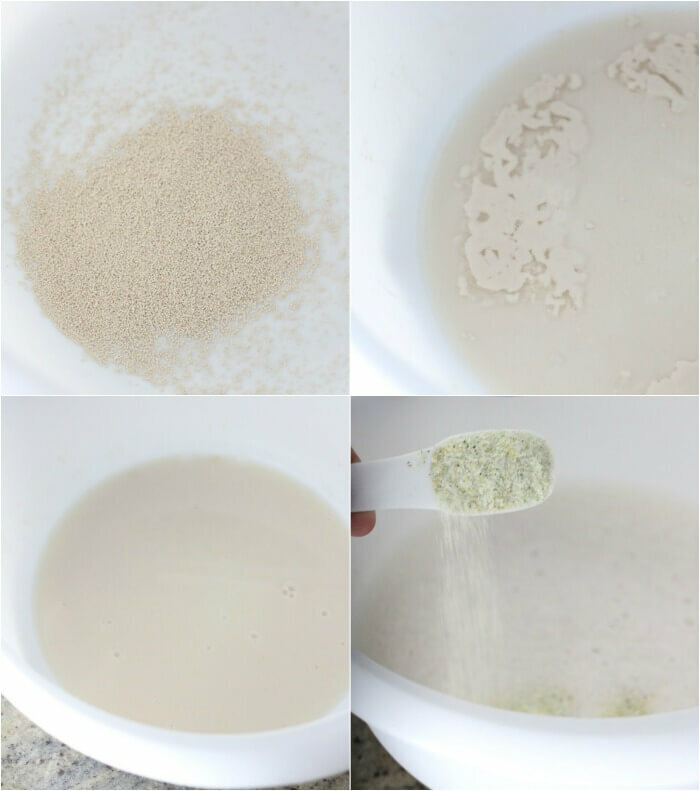 In a large bowl, dissolve yeast in warm water and set aside in a warm place for ten minutes. Add beer, garlic salt, and cheese to the bowl. Mix well. Add flour in one cup increments, until a sticky dough forms. Cover and let rise 60 minutes (I do it in my oven with the light on). Punch dough down, dump onto a well floured surface and shape into a ball. Drop dough ball into a well oiled cast iron pot (or onto a baking stone, or baking sheet, or into loaf pans) and slice an "X" in the top. Bake at 425 for 25 - 35 minutes (until it sounds hollow when you tap on it). I actually like Geillis Duncan. As twisted as she is, her character adds a lot to the series. for me it is claire! she is awesome! Jamie, because he seems so manly! Oh my goodness, the crust on this bread is perfect! I am an absolute bread addict, but I'm terrible at making it! Thanks so much for joining me in this fun series! I hope you enjoy the show's return! I like Roger… I love the series! You have nailed this recipe – now I want to make a big pot of chili and hunker down with a slice of this when it gets out of the oven. I love this idea for bread. 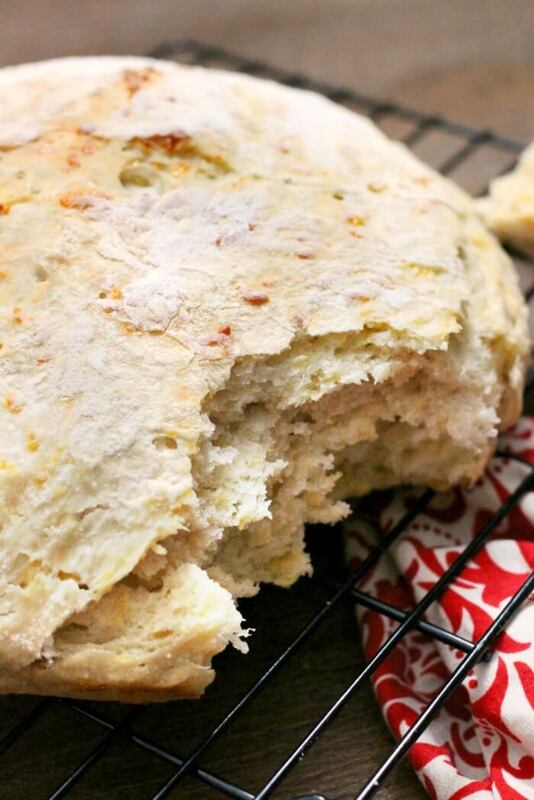 I like the idea of beer bread but the recipes using just baking powder always disappoint me! I am going to make this tomorrow….we are expecting another 8-10 inches of snow (sigh), and maybe this will make my day! !